We include Gate handles and Gate handle insulators in the kit so you can pass in front of a gate way . If your fencing does not have a entrance way in it these will not be required. 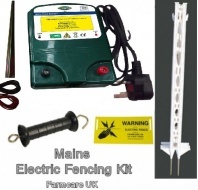 As this is a mains powered kit we have included 10 meters of lead out wire to carry the power from the energiser to the nearest part of the fence. If a longer length is required please contact us so we can alter the kit.